Sweeping in capillary electrophoresis (CE) involves the interaction of a pseudostationary phase (PS) in the separation solution and a sample in the matrix that is free of the PS used. The PS includes not only the PSs employed in electrokinetic chromatography, but also complexation reagents such as borate. The sample matrix could have a lower, similar, or higher conductance than the separation solution. Thus, the basic condition for sweeping is a sample matrix free of the additive. The accumulation of analyte molecules during the interaction makes this interesting phenomenon very useful as an on-line preconcentration method for CE. Preconcentration occurs due to chromatographic partitioning, complexation, or any interaction between analytes and PS. Contact between analyte and PS is facilitated by the action of electrophoresis and is independent of electroosmosis. The analyte, PS, or both should have electrophoretic velocities when an electric field is applied. The extent of preconcentration is dictated by the strength of the interaction involved. From tens to several thousand-fold improvements in detector response for many neutral and charged analytes have been achieved with this technique, suggesting sweeping as a general approach to on-line preconcentration in CE. 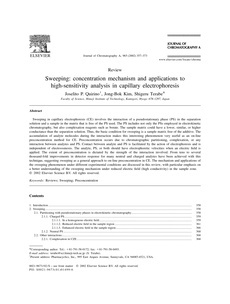 The mechanism and applications of the sweeping phenomenon under different experimental conditions are discussed in this review, with particular emphasis on a better understanding of the sweeping mechanism under reduced electric field (high conductivity) in the sample zone.